If you have diabetes, you probably know certain foods are better for blood sugar control than others. However, the benefits (or drawbacks) of consuming kefir may not be entirely clear. 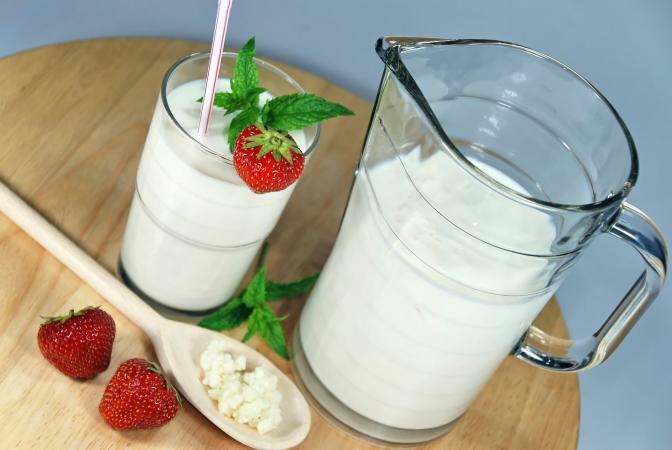 Believe it or not, kefir can be beneficial for people with diabetes. Why? One reason is kefir is rich in probiotics, good bacteria found in the gut associated with numerous health and wellness benefits. A 2015 study published in the Iranian Journal of Public Health found probiotics in kefir have anti-diabetic properties and can complement other forms of diabetes treatments. That's because HbA1C levels in people with type 2 diabetes (an indicator of diabetic blood sugar control) significantly decreased in the probiotics study group compared with a control group. A review published in 2016 in Diabetes Research and Clinical Care also found probiotics aid in type 2 diabetes blood sugar control by significantly lowering fasting blood glucose (the amount of sugar in your blood when you're in a fasting state). A review published in 2014 in Nutrition Journal points out probiotics appear to help increase insulin sensitivity through a host of factors, such as inflammation and oxidative stress reduction. Other components found dairy foods (in addition to probiotics) may be beneficial for people who have or are at risk of developing diabetes. A 2016 study published in The American Journal of Clinical Nutrition found higher total dairy intakes, especially rich in yogurt (another rich source of probiotics), are associated with lower risks for type 2 diabetes. While all dairy foods seem to be beneficial for type 2 diabetes prevention, those rich in probiotics (yogurt and kefir) appear to be the most beneficial says another 2015 review. There's no official recommendation for how much kefir you should drink daily when you have (or are at risk of) developing diabetes. However, a 2016 review published in the International Journal of Environmental Research and Public Health recommends adults at risk for developing type 2 diabetes consume three to four servings of low-fat dairy daily. One portion equates to 1 cup of kefir, yogurt, or low-fat milk. A variety of a kefir products are available. Plain, low-fat kefir is healthier (and better for blood sugar control) than flavored kefirs, which can be high in added sugar. For example, Lifeway strawberry-flavored kefir contains 20 grams of sugar, while the plain flavor provides just 12 grams of sugar per cup. Drinking too much kefir high in added sugar may be counterproductive for blood sugar control, which is why choosing plain is best. Try drinking kefir between meals or as part of breakfast to get in some extra servings of dairy and probiotics for blood sugar control when you have or want to prevent diabetes. Consider blending a kefir smoothie with some fresh fruit and almonds. If you don't have kefir handy, other low-fat dairy foods will do the trick, especially yogurt. Aim for at least three one-cup servings daily.